Where do I get the initial practice test? All practice test are available for download and print within the Student Account. 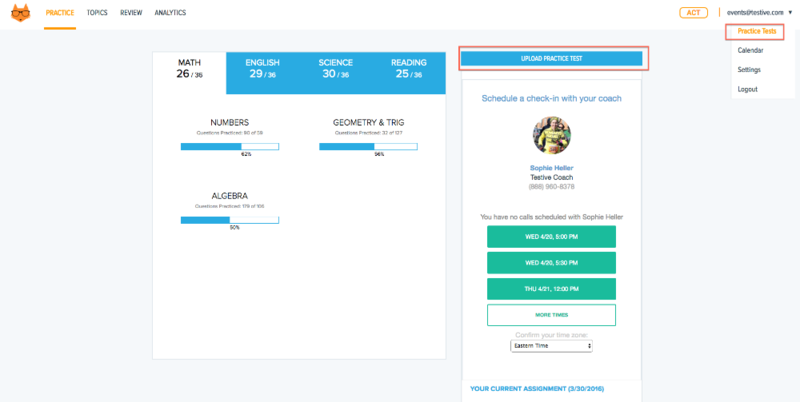 You can click on the "Upload Practice Test" or "Practice Tests" to access your practice tests and practice test data. You will then be taken to a screen that looks like this. You can pick any one of the 6 practice tests listed, but we usually recommend getting started with "PDF Practice Test". Download the test and the answer sheet, then print it out using a home or office printer (yes, good ol' fashioned paper and pencil test!). Print out the practice test and take the test under test conditions. It’s important to take the initial practice test (and all subsequent practice tests) in regular test conditions so the final score is as accurate as possible. Accurate results ensure that we can develop an appropriate curriculum that truly addresses a student’s weak areas. The test is timed. This is a 3-4 hour commitment, so make sure to set aside enough time! Make sure to follow the official directions for whichever test (ACT/SAT) you are taking. Why do I have to take it before starting my Coaching program? Students establish a baseline score from which they can set goals and measure improvement. We tailor a student's curriculum based on their performance on the initial practice test. Our technology breaks down the scores and identifies areas of strengths and areas of weaknesses. This way, we can make sure that every student is prepping exactly what and where they need to! This may not be what you want to hear, but it’s imperative that you complete a full-length test – and upload to it Testive – before the first meeting with your coach or before they start working on assignments. Our coaches use the information from this test to design a personalized study plan for each student in order to meet their test prep goals. Without this test, our coaches do not have the information they need to get your program started on the right foot. How are my parents involved?